A leading web application online hotel reservation system let you connect with global clients by providing them the unique search and book functionality. 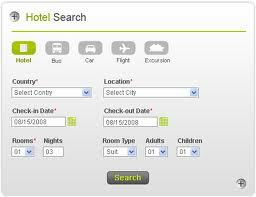 This online hotel reservation system is designed for any hotel, motel or travel websites. Customers and any travel agents can make searches, reservations and cancel an existing reservation on the hotel reservation’s web site. Administrator can add or update the hotel and the room information approve/disapprove a new travel agent’s account application and generate a monthly occupancy rate report for each hotel. This online application is designed using PHP and MySQL database.